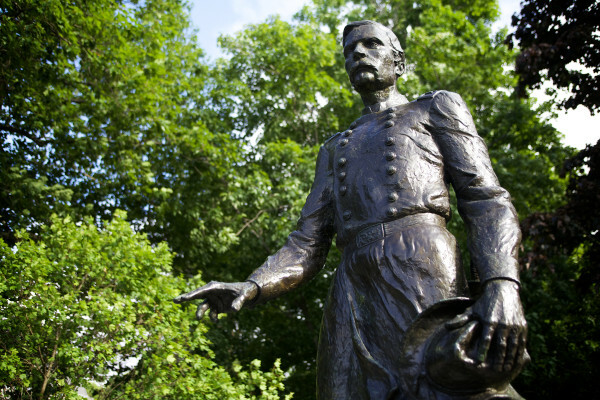 A statue of Joshua Chamberlain stands sentinel near an entrance to Bowdoin College in Brunswick in 2014. AUGUSTA, Maine — Leave it to Civil War Gen. Joshua Chamberlain to affect Maine politics 136 years after defusing an armed Augusta standoff that could have led to civil war. Law changes made after that 1880 standoff over who would be Maine’s next governor may sink an effort to change the way the state votes in 2016. It’s a complicating factor for advocates of ranked-choice voting, who submitted enough signatures last year to place on the November 2016 ballot a question that would implement the new voting system. Ranked-choice voting would allow voters to rank candidates for governor, the Legislature and members of Congress in order of preference in multi-candidate races, creating an “instant runoff” when no single candidate receives more than 50 percent of the total vote and counting second- and third-place votes if necessary. But Maine Secretary of State Matthew Dunlap says it likely conflicts with the Maine Constitution, which was changed in 1880 to say that a governor could be elected with a plurality — and not necessarily a majority — of votes. Proponents of the initiative have pushed back on the notion that ranked-choice voting is unconstitutional, but it’s a dispute that’s rooted in Maine political history and could invite a court challenge and constitutional amendment process. The insurrection made Maine allow plurality governors, but the ranked-choice campaign is a concerted effort to end that. In the Gilded Age, Maine politics had three major parties: the popular Republicans, Democrats and the upstart Greenback Party, which was backed by farmers who opposed that currency be backed by gold. When Alonzo Garcelon became governor in 1879, he was the first Democrat to hold the office in more than 20 years. In the election later that year, he finished a distant third to Republican Daniel Davis, who got just less than 50 percent of votes. But after that, Democrats and Greenbacks — or Fusionists — banded together to oppose Republicans, and the Legislature followed a bizarre procedure to pick the next governor: The House of Representatives would pick two of the top four finishers and the Senate chose from those two. So Garcelon alleged voter fraud, conspiring with the council overseeing elections to invalidate ballots on technicalities to try to gain seats in the Republican-led Legislature. Republicans won a court challenge, but Garcelon ignored the ruling and sat Fusionist legislators. Prominent Republicans began gathering armed brigades, including U.S. Sen. James Blaine, who mustered troops on the lawn of his home across from the State House. Blaine’s residence is now the governor’s mansion. Chamberlain, a hero of the Civil War and a former Republican governor, was then in charge of Maine’s militia. He went to Augusta, sent home armed men and was given command of the city’s police force. After threats of death and 12 tense days, he recognized the court ruling and ensured that Davis was seated. Later, Maine voters allowed the governor to be selected by a plurality of votes, a protocol they had already adopted in 1875 for members of the Legislature. But the current effort for ranked-choice voting comes after four straight gubernatorial elections decided by a plurality. Advocates have said it’ll ensure the candidate with the broadest support level wins. Neither Democrat John Baldacci nor Gov. Paul LePage, a Republican, won majorities in their sets of two victories. Independent Angus King, now a U.S. senator, was the last governor elected by a majority in 1998, his second term. That’s why the law could be unconstitutional and invite a court challenge. Portland uses ranked-choice voting to elect its mayor, but Maine would be the first state to adopt it statewide. However, past proposals to implement ranked-choice voting have been repeatedly defeated in the Legislature, partly because of constitutionality questions. In 2013, Dunlap’s office testified that a similar proposal would violate the plurality provision and another area of the Constitution that says ballots must be received, sorted and counted by cities and towns. Tim Feeley, a spokesman for Attorney General Janet Mills, said the Democrat’s office shares Dunlap’s concerns about constitutionality. On Tuesday, Rep. Heather Sirocki, R-Scarborough, took to the House floor calling for legislative committee hearings on the bill to explore its constitutionality before sending it to voters. But Dunlap said while it appears to be unconstitutional in “bold face,” a new law is presumed to be constitutional until it’s challenged in court and that’s “not a relevant question” before the Legislature. “I think the discussion still has to happen,” he said. A constitutional amendment can happen in two ways in Maine: The Legislature — with a two-thirds vote — can refer an amendment to voters or call a convention, and the constitution hasn’t been changed since 2011. The campaign has argued that the proposal is constitutional, even devoting a portion of a question-and-answer section to that on a website. But if an amendment is needed, Rep. Diane Russell, D-Portland, one of the effort’s main drivers, said legislators will have to respect voters and make necessary changes or risk being ousted. “It’s really going to be dangerous to vote against a constitutional amendment,” she said.